We’re at the family cottage enjoying a much longed-for summer break. The summer is so fleeting and already we notice the chill in the breeze at night, the red squirrels madly storing pine cones, and a slight shift in the smell of the air, even though it’s only mid-August. I love cooking on holidays when there is more time, the pace is more relaxed, and there is more incentive to be creative with the limited stores of food in the fridge far away from the convenience of the city. 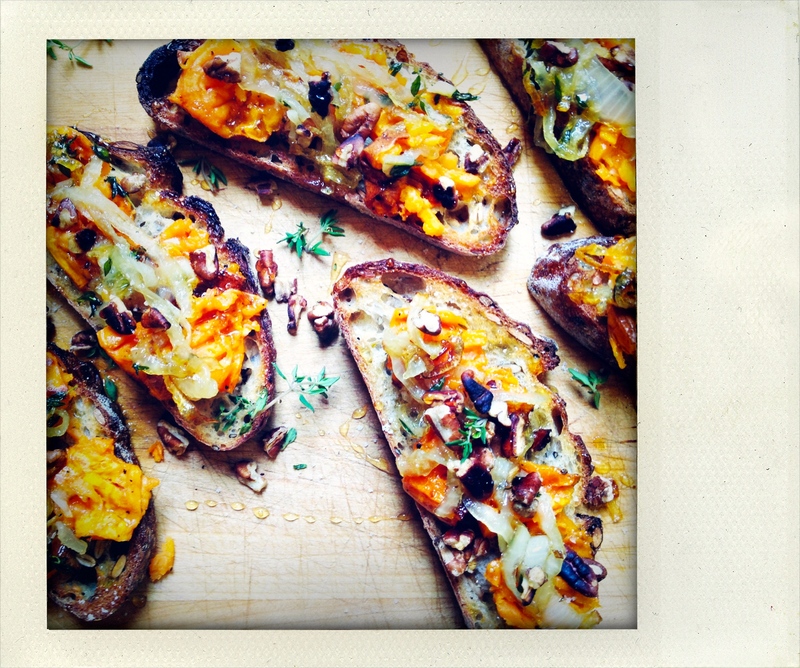 Our lunch today was a simple green salad and these stupidly easy and tasty sweet potato pecan crostini with sautéed onion and thyme. What’s not to devour? They proved to be a fantastic mid-day meal, and the perfect set-up for an afternoon in the hammock with a good book. Pre-heat the oven to 375 degrees. 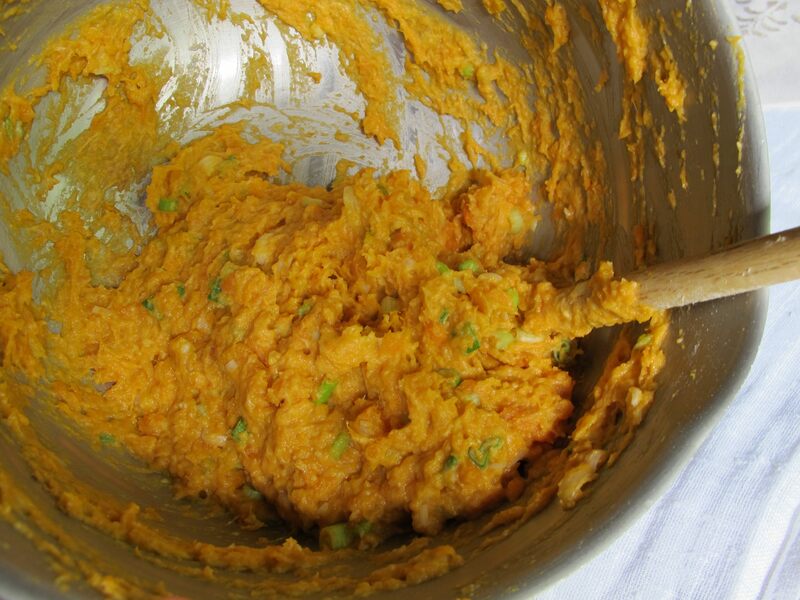 Toss the cubed sweet potato with maple syrup, 1 tbsp of the olive oil and some sea salt and pepper to taste. 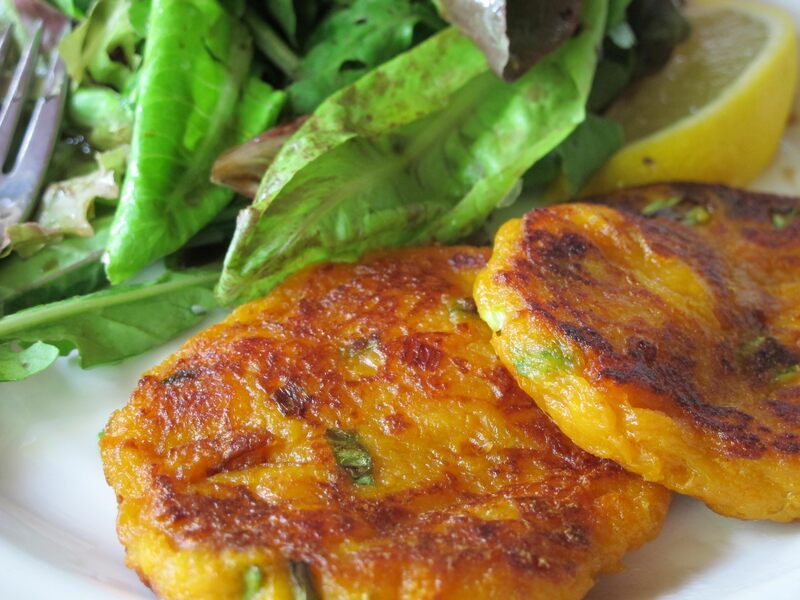 Place on a cookie sheet lined with parchment paper and bake until soft and slightly browned, about 20- 25 minutes. Meanwhile, add the other 1 tbsp olive oil to a small skillet on medium-high heat. Add the sliced onion and thyme and sauté until softened, fragrant, and slightly crispy on the edges. Remove from heat and set aside. Toast the pecans in the oven or in a small skillet on the stove if they aren’t already toasted and set aside. Once everything is ready, toast 6 slices of good bread. Place on a cutting board and add a healthy dose of sweet potato, squishing it down into the bread slightly with the back of a fork to make it a little more manageable to eat. Top with onions and pecans. Drizzle with honey or maple syrup depending on your preference. Sprinkle with a bit of sea salt and pepper to taste. Serve. 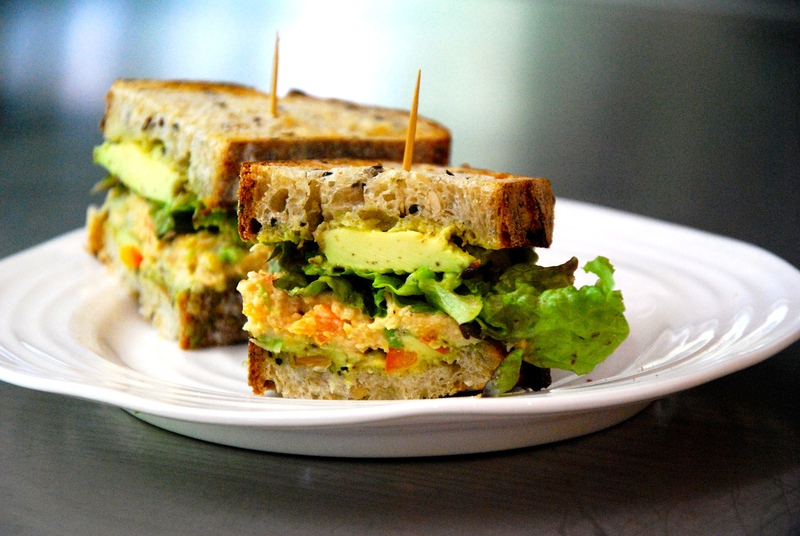 Thanks to The Simple Veganista for this smiple vegan chickpea salad sandwich. Brilliant idea and super tasty. On some toasted Blackbird Baking Co Seedy Sourdough, with mashed avocado and lettuce, it’s all anyone could want in a salad sandwich – as in old school tuna salad or chicken salad – but veganized. And it’s the perfect picnic fare on this first day of summer as we head into long lazy Saturdays at the beach or in the park. Drain and rinse the chickpeas, whether canned or home-cooked. Place in a medium-sized mixing bowl and mash with a fork or potato masher. Add the rest of the ingredients and mix well. If you need a little more liquid to soften up the tahini, you can always add a little warm water. Season to taste. Serve on toasted whole grain bread with whatever condiments and additions tickle your fancy. Bekah has been surfing fabulous food blogs and somehow tripped upon My New Roots. It’s a great food blog by a Torontonian living in Copenhagen and it has a beautiful blended feel of both the austerity and crispness of Scandinavia and the down-to-earth rootedness of Canada. That’s my take anyway. 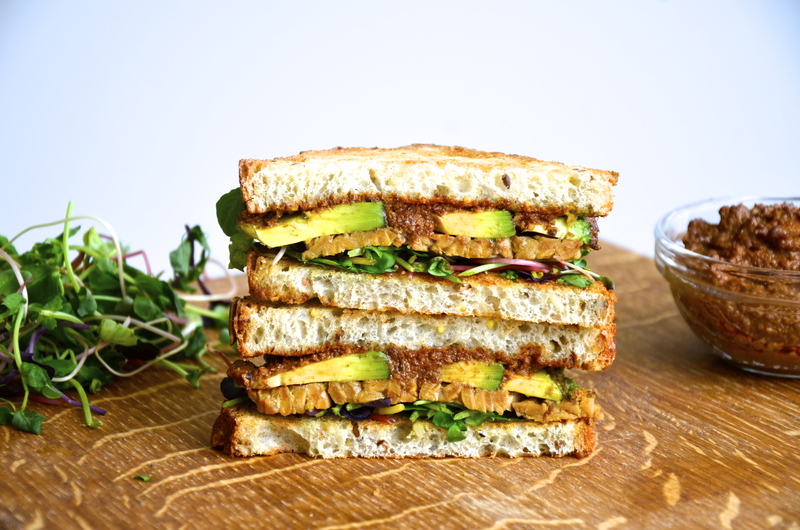 Sarah Britton, who created the blog, posted this scrumptious looking smokey tempeh sandwich with sun-dried tomato pesto, so Bekah and I whipped it up for lunch, Bekah did the photography honours (because she’s way better than me), and then we tucked into what is a very tasty sandwich. The bread makes a big difference – as does the quality of all the ingredients – so make sure, as Michael Pollan would say, to pay more and eat less. It’s worth it. Place the tomatoes in a bowl and cover with just-boiled water. Let soak until soft, about 30 minutes. In a dry skillet over medium heat, lightly toast the pumpkin seeds until they puff up and smell nutty. Be careful not to burn them! If you want a completely raw pesto, skip this step or soak the seeds overnight to activate them. Drain the tomatoes through a strainer over another bowl to catch the water – you need to save the liquid for the pesto as it contains many nutrients and tons of flavour. 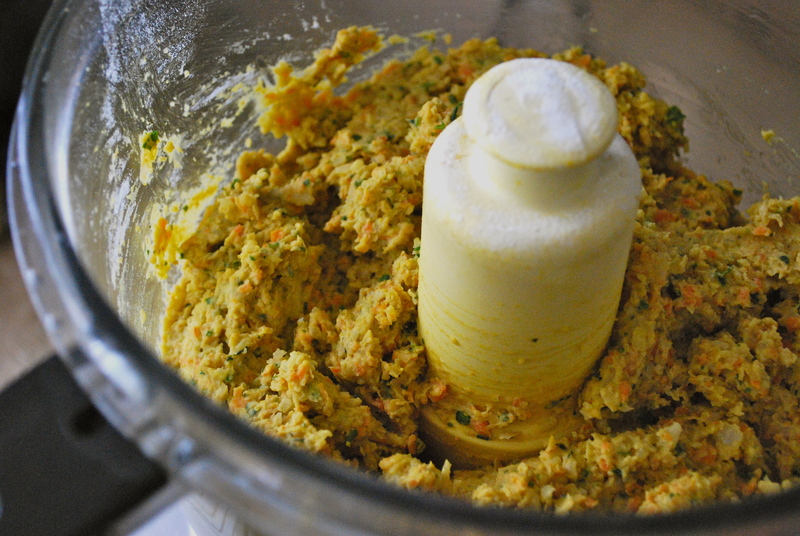 In a food processor, pulse peeled garlic to mince. Add all other ingredients, except salt and sweetener, and blend on high until smooth. Taste for seasoning and add salt or sweetener if desired. Store in a tightly sealed glass container in the fridge for up to one week. 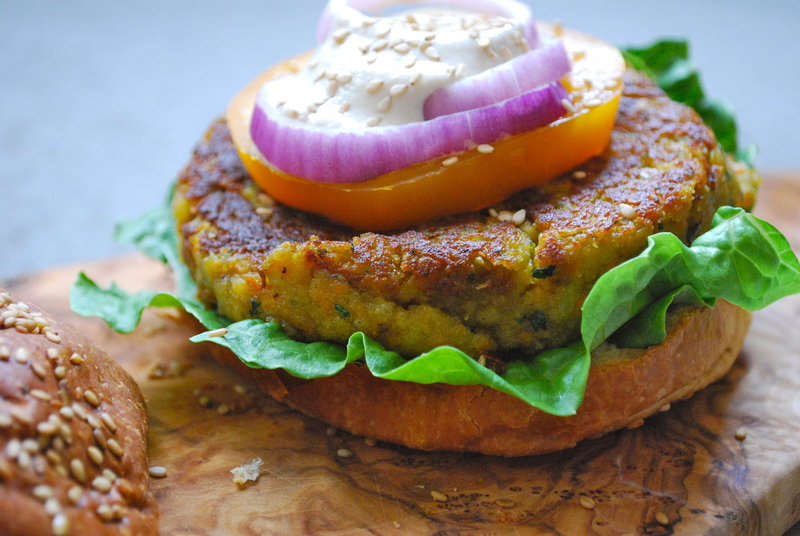 Enjoy on sandwiches, with eggs, on pasta, or as a dressing on grain salads and fresh veggies. Slice the tempeh into slabs or long strips, depending on the shape of your block of tempeh. In an oven-proof dish whisk together all other ingredients. Place the tempeh in a single layer covering the bottom of the dish, then flip each piece so that it is coated with the marinade on both sides. Place in a 375°F / 190°C oven for 20-30 minutes until the tempeh has absorbed the marinade. Remove from oven and let cool until you are ready to make your sandwiches. Slater one half of the bread with sun-dried tomato pesto. Place sliced avocado on top of the pesto, followed by tempeh and greens. Serve immediately and enjoy, or wrap up for a picnic later in the day. I came home from work yesterday and found my eldest, Joshua, in the kitchen with his black apron on making super yummy garlic bread out of pizza dough. Good on ya Joshua! Wow – I must have done something right. Try it out. It’s simple. It’s easy. It’s tasty. It’s vegan. It’s pretty. It’s a great way to transition from the hub-bub of work to the hub-bub of making dinner. A quiet calm with a glass of pinot grigio before diving into the cacaphony of the evening. Or what a great Saturday afternoon snack al fresco. Flour the top of your dough, cover it with plastic wrap, and let it rest for at least 15 minutes at room temperature. This will make it easier to roll it thinly. Meanwhile, combine minced garlic and olive oil. Chop fresh parsley. When the dough has risen, grab a chunk of dough about the size of a large fist. Roll it out. Place on a pizza stone. Brush with garlic oil and chopped parsely. 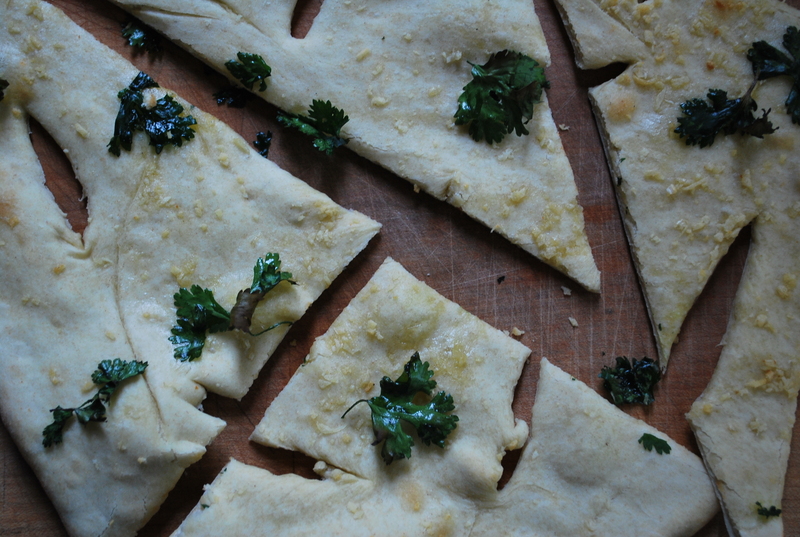 Cut slits into the dough for a nice aesthetic look and bake at 500 degress for about 8 – 10 minutes.